With the U.S. economic expansion well into its eighth year, some states are experiencing what might seem like an enviable problem: not enough people to fill all the available jobs. Utah and Colorado, among others, are reporting local worker shortages and record or near-record low unemployment. And nationally, job openings remain at their highest levels since the turn of the century. As of the end of April, nonfarm employers reported more than 6 million job openings, according to seasonally adjusted data from the government’s Job Openings and Labor Turnover Survey (known as JOLTS). Although there are still more people without jobs than there are job openings – about 6.9 million people reported being unemployed in May – the monthly estimate of open positions has been above 5.5 million for all but one month since the start of 2016, a sign of the U.S. economy’s relative health. In July 2009, just past the trough of the Great Recession, employers reported fewer than 2.2 million job openings, the lowest total since the Bureau of Labor Statistics began collecting JOLTS data in 2000. Another way of looking at the vacancies data is the job openings rate, which is calculated by dividing the total number of openings by the sum of total employment and openings. (The higher the rate, the greater the nation’s unmet demand for labor.) The openings rate was a robust 4% in April, matching the high points reached in July 2015 and July 2016. 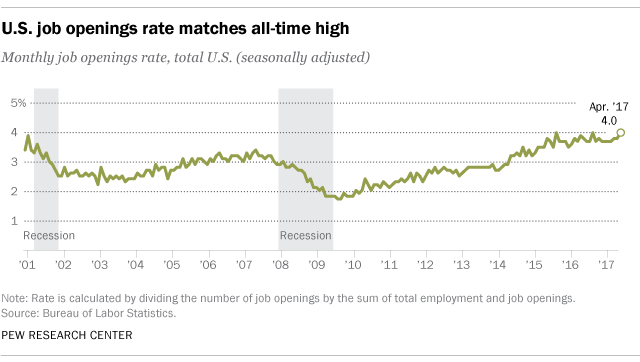 Like the total number of job openings, the openings rate bottomed out in July 2009, at 1.7%. The JOLTS program doesn’t produce state-level data, but it does indicate that the South had the most job openings in April of any region – nearly 2.2 million – though the openings rate there (3.9%) was slightly below that of the nation as a whole. The Midwest had the nation’s highest regional openings rate (4.4%), followed by the Northeast (4.1%); the rate in the West lagged behind at 3.6%. Nationally, workers appear to be in shortest supply in two service sectors: professional/business services and healthcare/social assistance. 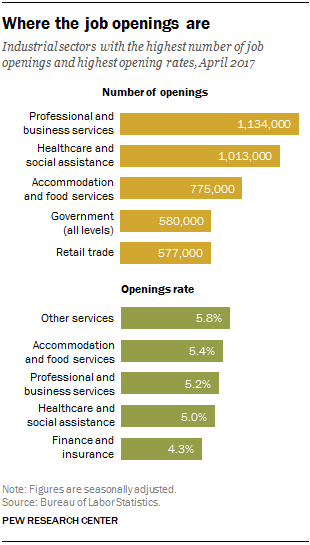 Both had well over 1 million job openings in April – roughly one-third more than the sector with the third-highest number, accommodation and food services. All three of those sectors had openings rates of 5% or higher, as did the catchall “other services” sector. The lowest openings rate (1.7%) was in state and local public education, which historically has either the lowest or among the lowest rates of any sector. However, the sector with the fewest estimated openings in April was mining and logging, with just 22,000 job openings nationwide. Note: This is an update of a post originally published June 2, 2017.